Even if the infamous NSA's spying tactics didn't quite hit you on a personal level, you may be the next target for businesses looking to track consumers' everyday movements. Headed to your local cafe for a quick coffee? You may want to turn off your phone's Wi-Fi first. Startups that specialize in hyperlocal tracking are popping up in the growing field — and they are taking hesitant first steps into invading your movements outside the home. Citizens' information is now being gathered where they least suspect it, Ryan Calo, assistant professor at the University of Washington School of Law, tells the Wall Street Journal. "Companies are increasingly able to connect between our online and offline lives," he says. One such startup, called Turnstyle, tracks people in about 200 downtown Toronto businesses. The company gleans information from sensors placed around restaurants, nightclubs, clothing stores, hotels, and yoga studios. The sensors pick up data from Wi-Fi off smartphones, literally following people around as they go about their daily chores and activities. Turnstyle is able to categorize people into groups, like over-30s and hipsters, and provide local businesses with information on who exactly is visiting their stores. Bigger companies like Verizon and Apple have also released similar prototypes to track consumer movement. In Canada, consent is required before utilizing a person's username, but that isn't the case in the United States. Sen. Al Franken, D-Minn., wants to change that. Last year, Franken introduced a privacy protection bill that would require a one-time OK from people using a particular tracking app, ban "stalking apps," and require apps to provide the advertising networks they share information with. Franken is railing against a company called Euclid, which also uses sensors to automatically track users at football stadiums and at stores like Nordstrom. The businesses pay Euclid about $200 per month for aggregated data. The amount of data companies can track may come down to the people they are actually tracking — the public — according to Marvin Ammori, a First Amendment attorney. Are you comfortable being potentially tracked whenever you go out to dinner or lug a load of clothes to the laundromat? Care about privacy? 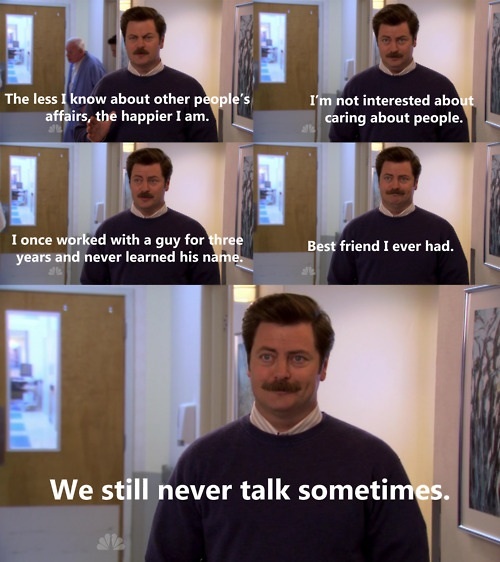 You could always try Parks and Recreation's resident recluse Ron Swanson's approach.